Counting occurence of unique points across large grid using QGIS? I am attempting to map out, in a 10x10 km grid, the occurrence of unique plant species. I have used the "Points in Polygon" feature to count and map the unique points across the grid, however I have a new need. I have a .csv file with >100,000 observations of plants, and I want to count how many grid squares each plant species occupies, but only count it once for each grid square. So say I have 200 total 10x10 km grid squares I want to be able to say "Species A occupies 10 different 10x10 km grids, Species B 100 different... etc. 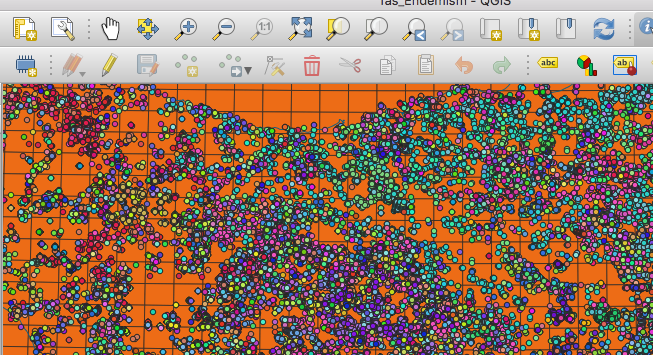 The first step is to join attributes by location see answer by Ursulka Siete Tutorial for QGIS, this will attribute your points with the matching polygons they fall within. Next get tabular statistics for your points use a dissolve field of your species and a summary field of polygon FID (or other unique identifier field) and a summary type of count. This should give you a field listing each unique species and the number of polygons it appears in. Note: I have not tested this plugin. I have ArcGIS and use Summary Statistics to perform similar operations. You might need to test a few statistical plugins before you get a result you can use. As Luke pointed out, you can use Microsoft Excel (or similar spreadsheet program) to create a pivot table to summarize the information correlated by joining the attribute tables. The DBF component of a shapefile is a DBASE IV file which is readable by Excel (just don't save with Excel, it will break the shapefile) and probably a lot better at summarizing, charting and graphing aspatial data. Not the answer you're looking for? Browse other questions tagged qgis point vector-grid point-in-polygon count or ask your own question. Createing polygon layer from point data using QGIS? How to assign a grid value to points? Creating species richness map (as next stage after species distribution)?